In the new era of the Internet of Things (IoT), all information related to the environment, things and humans is connected to networks. Humans, too, can be considered an integral part of the IoT ecosystem. The growing human-centricity of IoT applications raises the need greater dynamicity, heterogeneity, and scalability in future IoT systems. Recently, the IoT and cloud computing have both evolved as emerging technologies and have already become part of our daily life. The complementary features of the IoT and cloud are forming a new IT paradigm to meet current and future requirements. Due to the increased demand for and volume of IoT data, it has become a critical challenge to transfer data from the edge of the network to computing data centers due to the limitations of network bandwidth and higher latency delay. The emergence of the new paradigm of computing in the cloud computing architecture has made it necessary to overcome the inherent limitations of cloud computing, such as location awareness, scalability, energy efficiency, mobility, bandwidth bottlenecks, and latency delay. 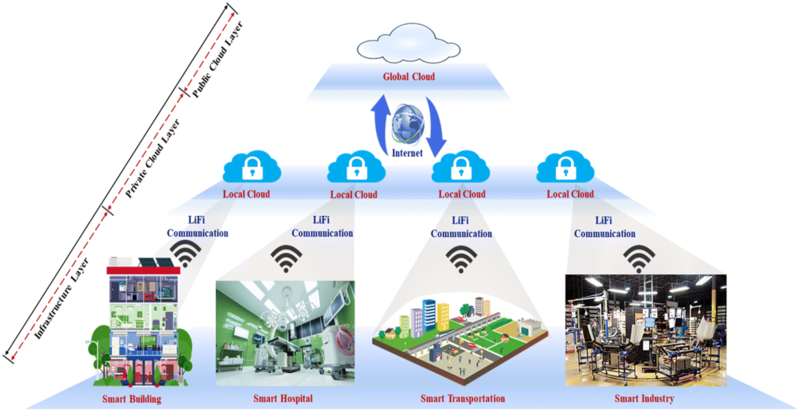 To address these issues, this paper proposes an efficient hybrid cloud architecture framework coupled with Li-Fi communication for a human-centric IoT network. It also introduces the architecture of the local cloud to reduce the latency delay and bandwidth cost and to improve efficiency, security, reliability and availability. Finally, the paper discusses the communication modulation schemes in the Li-Fi technique and presents scenarios involving the application of the proposed model in the real world. In view of the ever increasing range of applications of the Internet of Things (IoT), it is essential that humans and things work together more effectively. The IoT has great potential to offer new services to human in almost every area of society. A human-centric concept introduced to support the daily lives of citizens in a discrete way based on their individual needs is an enabling element of the ambient-assisted living scenario. For human-centric operations, analysis of user behavior and needs is essential, resulting in the generation of large amounts of personal data that require effective processing and real-time application support. In recent years, the IoT has become the object of real technological enthusiasm and is increasingly showing up in concrete products and services. Current manual tasks can be automated and optimized and new services can evolve in the IoT by connecting things together and using powerful computing/storage resources. However, it is also one of the most disruptive technologies, enabling pervasive and ubiquitous computing scenarios. The IoT is typically characterized by small things in the real world that are widely distributed, with limited computing and storage capacity, which inevitably raises concerns about security, performance, and reliability. On the other hand, cloud computing has gained popularity, and we have now been using cloud-based services as a commodity on a daily basis for the last decade. For IoT-related technological issues, cloud computing is often advertised as a quick fix. In terms of computing power and storage, cloud computing has virtually unlimited capabilities. Most IoT issues can be partially resolved by cloud computing and it is a much more mature technology. These complementary cloud and IoT features could constitute a new IT paradigm and satisfy both current and future requirements [1–10]. In the IoT network, to collect and transfer large amounts of data in real time in a heterogeneous environment, smart devices are densely distributed with limited energy, computation, and storage resources. But in cloud computing, due to the large volume of data, it is not easy to transfer data from the edge of the network to the computing center because high bandwidth is required for its transmission. In the future, in the wireless domain, a system of this complexity is not feasible due to the limitations of bandwidth, computing, and energy resources. Apart from these issues, in the case of time-sensitive applications such as real-time analysis, emergency services, and human–machine interactions, unpredictable delays could ruin the user experience. To user in a new paradigm of computing in the cloud computing architecture, it will be necessary to overcome the inherent disadvantages of cloud computing related with location awareness, scalability, energy efficiency, mobility, bandwidth bottlenecks, and latency delay [11–13]. Meanwhile, in the IoT network, the available radio spectrum has become insufficient due to the increasing demand for wireless data communication. In 2011, Professor Harald Haas at the University of Edinburgh, Scotland first proposed the idea of Li-Fi. In the Li-Fi technique, we can transmit data via the visible light communication (VLC). Recently, it has become more interesting due to its security, availability, efficiency, and speed characteristics, which can help to solve many of the problems experienced by diverse organizations [14–19]. According to the latest market research forecasts, Li-Fi technology is expected to reach a market value of $8500 million by 2020 . Li-Fi comprises a line-of-sight propagation medium, a light source, and a light detector. Due to such considerations as energy efficiency, reduced costs and relaxed safety rules, LEDs are the preferred light sources for most applications. As a primary source of illumination, most public and residential environments will replace incandescent bulbs, and the majority of new energy-efficient lighting installations should be LED by 2018. Laser diodes seem to be a better choice for longer distances and higher speeds [21, 22]. An efficient hybrid cloud architecture with Li-Fi communication is proposed for a human-centric IoT network. To address such issues as reduce latency delay, bandwidth cost, etc., an SDN-based local cloud architecture enabled with Li-Fi communication is proposed; and various modulation schemes that could be used in Li-Fi communication are discussed. For proof-of-concept, different real world use case scenarios in which the proposed model can integrate effectively are presented. The rest of the paper is structured as follows: “Related works” section introduces the points of interest of the Li-Fi technique, the challenges of the existing cloud computing architecture, and existing research; “Proposed hybrid cloud architecture” section presents a novel efficient hybrid cloud architecture coupled with Li-Fi communication for a human-centric IoT network; “Case study of the proposed model and discussion” section discusses use case scenarios of the proposed model in the real world. Wireless technology has reformed the current work environment. With the advantages of WiFi, it also has certain limitations as wireless technology has notorious difficulty in making peace with its sworn enemy: the walls. However, it seems that some of these gaps could be resolved with Li-Fi technology. Li-Fi technology is a two-way, high-speed, wireless technology that uses the spectrum of light to provide a user experience similar to that of traditional wireless systems. The advantages of the Li-Fi technique are summarized below. Li-Fi works based on visible light communication technology using LED bulbs. Many indoor premises already have LED bulbs for lighting purposes; the same source of light can be used as a means of communication to transmit data. It is possible to adjust Li-Fi bulbs so that the light is barely visible to the human eye, when there is no need for light. The internet can be everywhere, wherever there is a light source. The transmission of high-speed data could be available everywhere because LED bulbs can now be almost found anywhere in the indoor premises. Unlike WiFi, Li-Fi works by using a very unique system, and it cannot be hacked because light cannot penetrate opaque and solid structures. It is only available to users in a room, while remaining inaccessible to anyone outside the workstation. Li-Fi is unbelievably quick, i.e. it is capable of achieving a speed of 1 Gbps in a normal environment and 100 Gbps in a laboratory environment. Li-Fi is 100 times faster than Wi-Fi. Unlike infrared, there is no danger to the health from visible light in illumination conditions. Li-Fi illumination conditions meet the safety standards for the skin and eyes, making it safe to use in any environment or situation. With the addition of a relatively simple and inexpensive front-end components running on the baseband, Li-Fi can be deployed in the existing lighting infrastructure. Due to the symbiotic relationship with energy-saving LED bulb lighting, Li-Fi transmitters are widely deployed. The installed LED light bulbs could be used to transmit information directly to the destination without having to run close to a mile of cable. 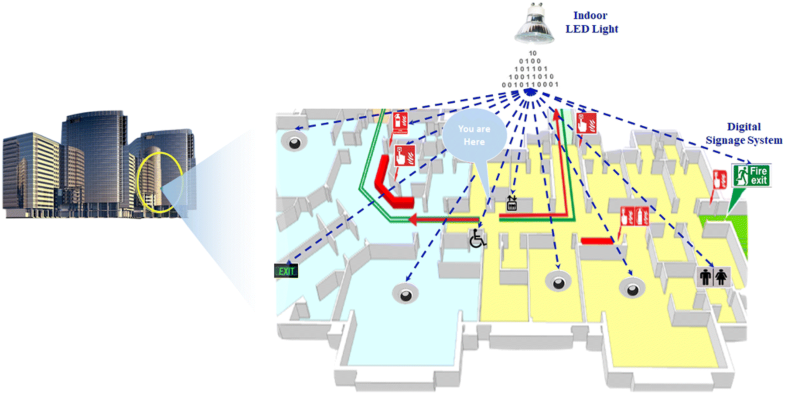 Indoor premises can remain connected to each other by using a point-to-point network, without using additional cables from one access point to another. For real-time applications in cloud computing, design, implementation, and operations present a number of challenges. In terms of real-time applications, and the need to improve the services of a specific domain, data is dynamically analyzed to obtain new information that can be used to provide services. In the traditional cloud computing system, the time taken to analyze data in real time and make decisions is usually very long and can greatly reduce the efficiency and benefits of applications. The following challenges must be met in cloud computing in order to design, implement, and deliver services for real-time applications. Whether as filtered events or raw events, all current events must be transferred in real time. All transferred events are also preprocessed before being transferred to the main control unit. The traditional cloud is good if the amount of events generated is not too huge. However, due to the rapid increase in demand for IoT devices and the ever-increasing volume of IoT data, the current cloud architecture is unable to provide services for real-time applications due to the limitations of network resources, bandwidth, and high latency delay. Organizations can reduce the cost of acquiring, managing and maintaining the system by switching to the cloud; however, they may need to spend more on the network bandwidth. Usually, there is no problem processing a small amount of data for a small application; however, for data-intensive applications, the cost can be high. The complex and intensive data transmitted and received across the network to the traditional cloud require sufficient bandwidth to avoid waiting times and delays. In many organizations there may be data or applications with which they never feel comfortable enough to allow them out of their sight. We need to pay special attention to this problem because demand is so important and because the traditional architecture of the cloud is not sufficiently capable of providing the necessary security measures at present. As with security, availability and reliability are an issue for cloud service providers. When the integration of IoT and cloud is adopted for critical applications, reliability problems typically arise in the context of intelligent mobility; vehicles are often in motion; and vehicular networks and communication are often intermittent or less reliable. There are a number of issues related to the failure of a device or devices that are not always accessible when applications are deployed in resource-constrained environments [1, 23, 24]. It is an essential characteristic to maximize the value of cloud services, and this needs to be addressed. For many IT departments, this challenge already exists within their organizations in the form of Bring Your Own Device (BYOD) and IT. In addition, a well-integrated environment can provide better services compared to the incremental gains resulting from the introduction of discrete cloud services within an organization. Even though the IoT and Cloud are two different domains that have evolved rapidly and independently of each other, their characteristics are often complementary. Generally, to obtain advantages in specific application scenarios, complementarity characteristics are the main reason cited by many researchers in integrating the IoT and Cloud [25–27]. 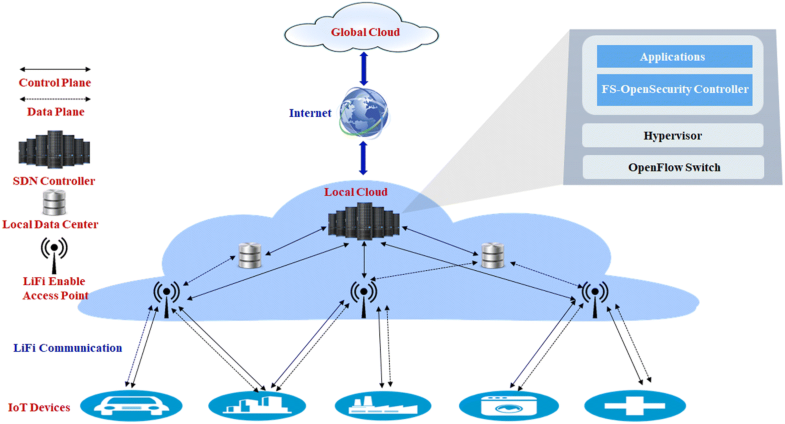 To manage things more dynamically and distribute them in the IoT-Cloud, the scope of cloud computing must be extended by introducing the middle layer to reduce the complexity of the cloud. In the multi-cloud environment, new challenges have emerged with regard to the collection, processing, and transmission of information . IoT devices do not allow the processing of complex data on site due to the limitations of energy and processing resources. Generally, collected data are transmitted to the nodes of the upper layer, which has more computational resources and the ability to aggregate and process collected data. However, scalability and low latency are difficult to achieve without the proper infrastructure. For the real-time analysis of data, sensor-centric applications, energy efficiency, complex event management, and scalability, the architecture must be properly designed [1, 28]. Currently, Software Defined Networking (SDN) has become one of the most attractive technologies in network research. It involves the separation of the data plane and the control plane, and the programmability of the network. By leveraging the strength of SDN, Nguyen et al. proposed an architecture designed to enable enterprise networks to easily and flexibly troubleshoot the virtual local area network. Gilani et al. introduced the network selection approach for mobility management using SDN and network function virtualization. On the other hand, many research groups and industries are very active in the field of Li-Fi. Gomez et al. adopted a new approach toward networking using Li-Fi with bidirectional speeds of 224 Gbps. They demonstrated a wireless link of this type with a field of view that provides practical coverage in an indoor environment . Meanwhile, EnLighting is a communication system proposed by Disney Research in Zurich as a means of providing device-to-device communication with low data throughput . Recently, Ayyash et al. demonstrated coexistence between Li-Fi and Wi-Fi towards 5G. Using state-of-the-art Li-Fi and WiFi front ends, they demonstrated through proof-of-concept results that the two technologies can together more than triple the throughput for individual users and provide a solution that adequately addresses the need for in-house coverage improved with the highest data rates required in the 5G mobile networks. The growth of heterogeneous human-centric IoT networks demands a faster and more energy-efficient service architecture capable of satisfying real-time requirements. The traditional centralized cloud architecture failed to provide energy-efficient, low-cost, low-latency delay services for real-time applications. The need has arisen to design a new architecture that meets the challenges for real-time applications. This section describes the efficient hybrid cloud architecture coupled with Li-Fi communication for a human-centric IoT networks. Figure 1 shows the overview of the proposed architecture. The proposed architecture is grouped into three different layers: public cloud, private cloud, and infrastructure layers. The public cloud layer is traditional cloud computing, which is used to provide long-term pattern recognition, massive data analysis, large-scale event detection, and so on. Here, the local cloud node is considered a private cloud in the private cloud layer that is deployed at the edge of the network; and the infrastructure layer is the physical layer which consists of data producers and consumers. In this model, we propose to use the Li-Fi communication medium to communicate between IoT devices and local cloud nodes. As the speed of Li-Fi is much faster than the RF communication medium, the traditional cloud cannot provide the service at a high speed. Even though there is a high-speed communication medium at the edge of the network, it will remain useless until and unless our server provides high-speed services. To meet this challenge, this paper introduces the concept of the local cloud in the model architecture. Every organization will have its own local cloud, i.e. a private cloud, to provide the necessary services, and the local cloud will be connected to the public cloud via the internet. The architecture of the local cloud is discussed in detail in the next subsection. Figure 2 shows the architecture of the local cloud model. The local cloud model concept is introduced to enable Li-Fi communication and provide services at high-speed. The proposed model may also be referred to as the hybrid cloud. Each local cloud node consists of an SDN controller local data storage. We have taken advantage of the FS-OpenSecurity security model in SDN from our previous research work [34, 35]. FS-OpenSecurity is a pragmatic security architecture model consisting of the Software Defined Orchestrator (SDO) and SQUEAK layers to provide a secure and robust architecture that provides protection against diverse security threats. The IoT devices will be communicated with local cloud via the Li-Fi-enabled access point. The access point will act like the SDN forwarding device, which receives data from the end device/user through the Li-Fi communication medium, which is then forwarded to the controller upon the arrival of a new packet. The local cloud will perform periodical updates via the Internet. Here, it is assumed that an IoT device embedded with LED and photodiode will enable the Li-Fi communication. It is possible to achieve scalability, low latency, security, and high availability by deploying the local cloud, i.e. the “private cloud” at the edge of the network . In the real world, most organizations such as big smart complexes, shopping marts, airports, hospitals, smart car parks, and transportation entities need such an architecture to support real-time applications securely at high speed. The next subsection discusses the modulation schemes in Li-Fi. Li-Fi typically uses digital modulation techniques, but—with the necessary modifications—it can also use the modulation techniques used in RF communication. To support multiple users, Li-Fi uses modulation techniques such as Orthogonal Frequency Division Multiplexing (OFDM) and Sub-carrier Index Modulation OFDM (SIM-OFDM). By mixing colors through colored LEDs, Li-Fi transmitters are also designed and realized. The modulation signal must be both unipolar and pure valued, since the VLC can only be perceived as an Intensity Modulated Direct Detection (IM/DD) system. Techniques such as Pulse-Width Modulation (PWM), Pulse-Position Modulation (PPM), On–Off Keying (OOK), and unipolar M-ary Pulse Amplitude Modulation (M-PAM) can be applied relatively simply. A more resilient technique such as OFDM is required, as it allows adaptive bit and energy loading of various frequency sub-bands. It is essential to modulate the data in a carrier signal in order to send them as multimedia data via LEDs. The carrier signal consists of light pulses sent at intervals. Using the color intensities emitted by red, green, and blue (RGB) LEDs, an IM scheme such as color shift keying (CSK) is used, in which signals are encoded . By maintaining a constant average perceived color in CSK, the incoming bits are mapped on to the instantaneous chromaticities of the colored LEDs. Regarding the flicker effect over all frequencies and the reliability of the LEDs in CSK, a constant luminous flux is guaranteed and the constant luminous flux implies an almost constant LED control current, which reduces the possible inrush current in the modulation of the signal. For one study, a metameric modulation scheme has been developed based on the CSK scheme which can achieve higher energy efficiency . However, the metameric modulation scheme requires an additional and independently controlled green LED. For non-orthogonal and orthogonal optical channels, a color intensity modulation scheme is also proposed to maximize communication capacity . To facilitate the passage of the occupants during the evacuation of or circulation in a complex building environment, signage systems are widely used. A signage system includes both non-emergency and emergency signs designed to assist the occupants’ navigation and to locate an exit in an emergency situation. Generally, evacuees may tend to move along familiar routes in an emergency. This is related to a conceivable problem with the use of emergency exits, in other words, there is a marked tendency for individuals to head towards the entrance of a building instead of using the emergency exits. For the occupants, when there is no direct visual access to the exit due to a lack of reference points, orientation becomes difficult. Thus, signage systems improve way finding efficiency by conveying information to reduce the complexity of an enclosure where exits are not sufficiently apparent. Figure 3 illustrates use case scenarios for the proposed model that could be used in a digital signage system. The proposed model can provide an ideal base for dynamic digital signage solutions. Dynamic digital signage systems can be used for general public communication, pedestrian way finding, and to direct the occupants of a building environment in an emergency exit situation. Traditional signage systems are used as a circumvention aid much less than they actually could. 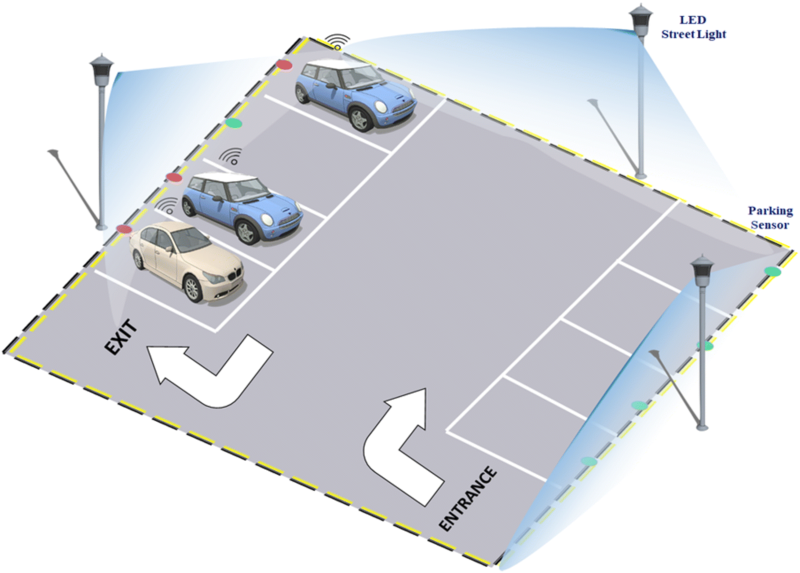 Using the proposed model, the effectiveness of a signage system can be improved by presenting the detectability feature and making real-time decisions more efficiently and quickly. The dynamic nature of the sign can be obtained by means of a set of LED lights activated and oriented towards the exit as a function of a given situation in real time. It is also possible for smart cities to lease digital signage spaces mounted on gateways both for advertising purposes and for generating revenue for the city. To reduce congestion and increase the efficiency of urban transport systems, a smart city must facilitate intelligent transport optimization solutions. A report by the Center for Economics and Business Research predicts that in the UK economy the total cumulative cost of congestion is estimated to reach £307 billion by 2030 ; and over a similar period, the annual cost of congestion anticipated would rise by 63% to £21.4 billion. This increase is largely attributable to increased demand for road travel due to population growth and higher per capita GDP, as the British economy continues to strengthen. Due to the search for parking places by drivers, 30% of traffic congestion is caused in urban areas, resulting in the release of incalculable carbon dioxide emissions in city environments. In addition, poorly managed parking has reduced the number of visitors to urban centers, resulting in lower revenues for local businesses . These problems could be addressed by installing sensors and cameras at LED traffic lights and street lamps and by using the proposed architecture to provide connectivity, make decisions, and provide real-time optimization solutions. Figure 4 illustrates the use case of smart parking using the proposed model. Using the proposed model, it is possible to provide information on the provision of parking, rates, and regulations etc. to drivers in real time via the Li-Fi communication medium between the street lamp and the smart car. Users can also be provided with information about non-parking areas, maps, loading areas, overtaking areas, and payment. This will result in lower fuel costs, less congestion, and less time spent looking for parking spaces in urban areas. Using the proposed model, traffic optimization solutions can be provided by installing sensors and cameras at LED traffic lights. Figure 5 illustrates a case of smart traffic light scenario use case. Using the proposed model, smart traffic lights can collect information in real time via installed cameras and sensors, analyze the data, and help users to make real-time decisions. It can provide live traffic conditions and optimal route suggestions to drivers using the digital signage system to avoid congested areas. It can also use the collected data to analyze and make future transport planning decisions. This will not only reduce congestion, pollution, fuel costs, and travel times but will also increase traffic visibility and improve road safety. To compare the proposed model with other approaches, a qualitative analysis of the proposed architecture was conducting using state-of-the-art approaches. Parametric qualitative performance metrics include scalability, distributed, flexibility, programmability and easy configurability of the network, and a secure high speed network service to meet the requirements of the future sustainable IoT network. Table 1 summarizes the qualitative analysis of the proposed architecture based on different parametric metrics. The integration of the IoT and cloud computing represents a new IT paradigm of next generation cloud computing in a sustainable IoT network. This integration will open up new and exciting solutions and a direction for organization and academic research. This study proposed a layered hybrid cloud computing architecture for a human-centric IoT network. IT used a Li-Fi communication scheme to reduce bandwidth costs and latency delay. It also proposed a local cloud architecture to secure the private cloud, meet current as well as future design requirements, and support a high-speed communication medium at the edge of the network. In addition, it presents a real world use case scenario in which the proposed model can be used. In future work, we will extend our proposed model and introduce an energy harvesting technique to build green cloud computing for the future internet. PKS: acquisition of data, analysis, and interpretation of related works; conception, design and amelioration of the complete model; and drafting of the article; JHR, KYP, JiHP: interpretation of the related works and the conceptual idea; JoHP: total supervision of the paperwork, review, comments, and assessment, etc. All authors read and approved the final manuscript. This study was supported by the Research Program funded by the SeoulTech (Seoul National University of Science and Technology).